CBD Oil Review rates Therabis with two stars because it qualifies for the Mission & Innovation Badges. There is an abundant amount of anecdotal evidence that alludes to the fact that Dr. Stephen Katz of Therabis offers strong and highly effective CBD oil products for animals. With decades of experience as a veterinarian and 10 years of research and development, Dr. Katz’s credentials speak for themselves. However, they owe it to themselves to publish documentation to verify the safety and quality of their pet-formulated CBD products to really put them over the top. Dr. Stephen Katz got his career start at George Washington University when he walked into the warden’s office and saw a 24-foot python wrapped around his leg. Using his natural affinity for animals, he was able to remove the python and the rest, as they say, is history. Dr. Katz is the brains behind Therabis, devoting over 10 years of his professional life to developing the CBD pet formulas that he now retails. The innovative formula he swears by is a combination of chromium, vitamin C, green-lipped mussel, and CBD oil. These ingredients have a powerful, synergistic effect when taken together. 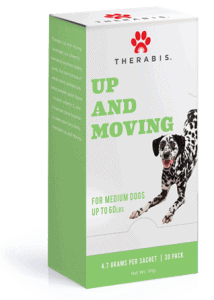 A decade in the making, Therabis claims this potent combo promotes calm energy, joint mobility, and skin health in pets. And they’ve got the glowing reviews to back it up. Dr. Katz states that seeing families struggle when their furry friends were no longer able to carry on their daily routines was personally painful to him as a veterinarian, and the natural remedies for many conditions so scarce, that he set out to find an alternative path for healing these extensions of our families. 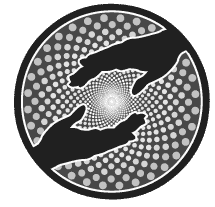 Animal lovers will find many useful tidbits in the blog section, where dozens of articles on natural healing, cannabidiol, and animals happily coexist. Prices for both the pet supplements and treat products range from about $10 to $60, and the product lineup focuses on three condition-specific supplements. 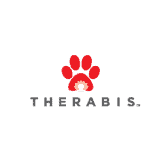 Worried dog owners can find relief for their pet’s itching, anxiety, or joint pain through Therabis’ herbal blends enhanced with natural cannabinoids. These CBD blends can be poured onto food or delivered via tasty chews. We feel a sense of dismay that we don’t know the source of the hemp that Therabis uses nor their extraction method, which prevents us from awarding the Quality Badge. We urge them to make this information public ASAP, especially since we do consider their CBD for pets top of the line. Also, there isn’t a CoA in sight to provide documented info on potency and contaminants. However, Therabis does claim that the Bronx Veterinary Center has rigorously tested their cannabidiol products for safety for the last 10 years. We believe them. 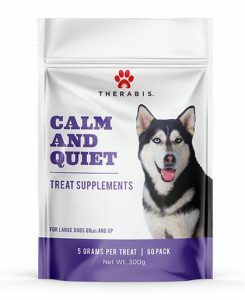 Bottom Line – With just a few simple changes and additions, we feel that Therabis could stand out as an elite vendor for pet-related CBD needs. They have all the credentials, experience, quality, and heart to get there. 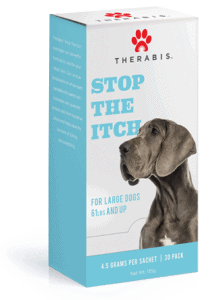 Therabis is on a mission to bring pets real relief with research-backed CBD oil formulations. Therabis uses a specialty formula of chromium, vitamin C, green-lipped mussel, and CBD oil that has been studied for 10 years to have powerful, synergistic effects.